Technologies such as brain‐computer interfaces are able to guide mental practice, in particular motor imagery performance, to promote recovery in stroke patients, as a combined approach to conventional therapy. The aim of this systematic review was to provide a status report regarding advances in brain‐computer interface, focusing in particular in upper limb motor recovery. The databases PubMed, Scopus, and PEDro were systematically searched for articles published between January 2010 and December 2017. The selected studies were randomized controlled trials involving brain‐computer interface interventions in stroke patients, with upper limb assessment as primary outcome measures. Reviewers independently extracted data and assessed the methodological quality of the trials, using the PEDro methodologic rating scale. From 309 titles, we included nine studies with high quality (PEDro ≥ 6). We found that the most common interface used was non‐invasive electroencephalography, and the main neurofeedback, in stroke rehabilitation, was usually visual abstract or a combination with the control of an orthosis/robotic limb. Moreover, the Fugl–Meyer Assessment Scale was a major outcome measure in eight out of nine studies. In addition, the benefits of functional electric stimulation associated to an interface were found in three studies. Neurofeedback training with brain‐computer interface systems seem to promote clinical and neurophysiologic changes in stroke patients, in particular those with long‐term efficacy. Neurofeedback (NFB) enables the voluntary regulation of brain activity, with promising applications to enhance and recover emotion and cognitive processes, and their underlying neurobiology. It remains unclear whether NFB can be used to aid and sustain complex emotions, with ecological validity implications. We provide a technical proof of concept of a novel real-time functional magnetic resonance imaging (rtfMRI) NFB procedure. Using rtfMRI-NFB, we enabled participants to voluntarily enhance their own neural activity while they experienced complex emotions. The rtfMRI-NFB software (FRIEND Engine) was adapted to provide a virtual environment as brain computer interface (BCI) and musical excerpts to induce two emotions (tenderness and anguish), aided by participants’ preferred personalized strategies to maximize the intensity of these emotions. Eight participants from two experimental sites performed rtfMRI-NFB on two consecutive days in a counterbalanced design. On one day, rtfMRI-NFB was delivered to participants using a region of interest (ROI) method, while on the other day using a support vector machine (SVM) classifier. Our multimodal VR/NFB approach was technically feasible and robust as a method for real-time measurement of the neural correlates of complex emotional states and their voluntary modulation. Guided by the color changes of the virtual environment BCI during rtfMRI-NFB, participants successfully increased in real time, the activity of the septo-hypothalamic area and the amygdala during the ROI based rtfMRI-NFB, and successfully evoked distributed patterns of brain activity classified as tenderness and anguish during SVM-based rtfMRI-NFB. Offline fMRI analyses confirmed that during tenderness rtfMRI-NFB conditions, participants recruited the septo-hypothalamic area and other regions ascribed to social affiliative emotions (medial frontal / temporal pole and precuneus). During anguish rtfMRI-NFB conditions, participants recruited the amygdala and other dorsolateral prefrontal and additional regions associated with negative affect. These findings were robust and were demonstrable at the individual subject level, and were reflected in self-reported emotion intensity during rtfMRI-NFB, being observed with both ROI and SVM methods and across the two sites. Our multimodal VR/rtfMRI-NFB protocol provides an engaging tool for brain-based interventions to enhance emotional states in healthy subjects and may find applications in clinical conditions associated with anxiety, stress and impaired empathy among others. Neurofeedback (NFB) is a novel application of brain-computer interfaces that aids real-time voluntarily regulation of brain activity. Mounting evidence shows that NFB has promising effects to enhance behavior, cognitive and emotional processes in normative samples (1–5). NFB has also been preliminary used to restore aberrant neurobiology and symptoms in neurological conditions (e.g., stroke, traumatic brain injury) and in psychopathology (e.g., ADHD, autism, depression, addiction) (1–7). Real-time functional magnetic resonance imaging (rtfMRI) based NFB has the potential to provide insight in understanding the mechanisms of psychological states (8–10). These include affiliative emotions (11) underpinned by deep brain nuclei (12, 13) the activity of which is unlikely to be robustly measured via surface electroencephalography. rtfMRI NFB tools can be used to study the causal mechanisms of complex emotions and to inform evidence-based personalized interventions to enhance and recover aberrant emotional states (and their neural substrates) in normative and clinical samples. One key practical human challenge of fMRI studies includes participants being distracted and experiencing difficulties to feel valid psychological states in the scanner environment, particularly when trying to sustain complex emotions. Recent studies have combined immersive virtual environments with multiple sensory modalities to deliver psychological/cognitive interventions, and to enhance their effectiveness via engaging and motivating individuals to practice (14–16). Only two proof of concept studies have combined rt-NFB with virtual environments as brain computer interfaces (BCI). An electroencephalography-based NFB study computed brain activity from about 500 participants collectively, during an interactive game of relaxation and concentration over one night (16), where individual’s level of brain activity could not be discerned. A separate rtfMRI-NFB paradigm used a virtual fire interface to up-regulate and down-regulate brain activity in eight healthy participants—but this was devoid of any emotional states and far from multimodal and immersive (17). It remains untested whether rt-NFB platforms integrating multisensory virtual environments can successfully recruit complex emotions and sustain these emotions long and strong enough to probe their underlying neural correlates. Such a platform can advance NFB applications, via (i) increasing the ecological validity of rtfMRI-NFB experiments, and their relevance for the daily experiences of emotions outside of experimental settings, (ii) adapting NFB interfaces to the individual and target population so these are more relatable, engaging and effective in generating and sustaining complex emotions that maximize the success of rtfMRI-NFB interventions (18–20). This study aims to demonstrate the feasibility of an engaging rtfMRI-NFB interface that can be individually tailored and, specifically, to provide a proof of concept for a rtfMRI-NFB integrating a virtual environment as a BCI and musical stimuli using both local (region of interest, ROI) and distributed (support vector machine, SVM) analyses. The FRIEND Engine Framework system (21) was enhanced and adapted for this aim. We recruited healthy young adults performing rtfMRI-NFB during complex emotion experiences, including tenderness—a positive affiliative emotion – and anguish—a self-reflective negative emotion (11, 13, 22–25). We also aimed to validate the functional anatomy of these complex emotions during rtfMRI-NFB. After the real-time data was collected, we ran offline fMRI data analyses to verify the effects of the real-time neurofeedback task on brain activity using standard preprocessing and statistical analysis methods. We hypothesized that participants would voluntary change the color of a virtual environment in the BCI during rtfMRI-NFB using the activity of the following regions: (i) for the tenderness condition, the septo-hypothalamic area (when using ROI-based rtfMRI-NFB method) and other brain areas ascribed to positive affiliative emotions i.e., medial orbitofrontal areas (when using SVM-based rtfMRI-NFB method) (11, 25–27); and (ii) for the anguish condition, the amygdala (during the ROI-based fMRI-NFB method) and also lateral prefrontal cortices implicated in negative affect (e.g., anguish, fear, anxiety, negative mood, stress, psychological pain), and in psychopathologies where negative affect is a feature [e.g., depression and generalized anxiety disorder (28–32)] (during SVM-based rtfMRI-NFB). We used a single subject, repeated measures design with two identical assessments on two consecutive days, counterbalanced by rtfMRI-NFB method (i.e., ROI and SVM). We recruited eight psychiatrically and neurologically healthy postgraduate research students, free of psychoactive medication and with normal or corrected-to-normal vision. Four participants were recruited from the D’Or Institute for Research and Education (IDOR) in Rio de Janeiro, Brazil (approved by the Ethics and Scientific committees of the Copa D’Or Hospital, Rio de Janeiro, Brazil – No 922.218). To validate the protocol in a different scanner and institution, we also recruited four participants from the Monash Biomedical Imaging (MBI) at Monash University in Melbourne, Australia (MUHREC CF15/1756 – 2015000893). All volunteers provided written informed consent prior to study participation. Supplementary video 1 and Figure 1 show the BCI used for the rt-fMRI NFB. The BCI comprised a virtual environment as a medium to convey sensory feedback to participants in real time, in association with ongoing tenderness, anguish and neutral emotional states. The virtual environment was created by editing the Unity 3D asset Autumnal Nature Pack (Unity 3D, https://assetstore.unity.com/packages/3d/environments/autumnal-nature-pack-3649) and displayed a first-person navigation at walking speed through hills and cornfields, with a total duration of 10′8″ (Supplementary Video 1). 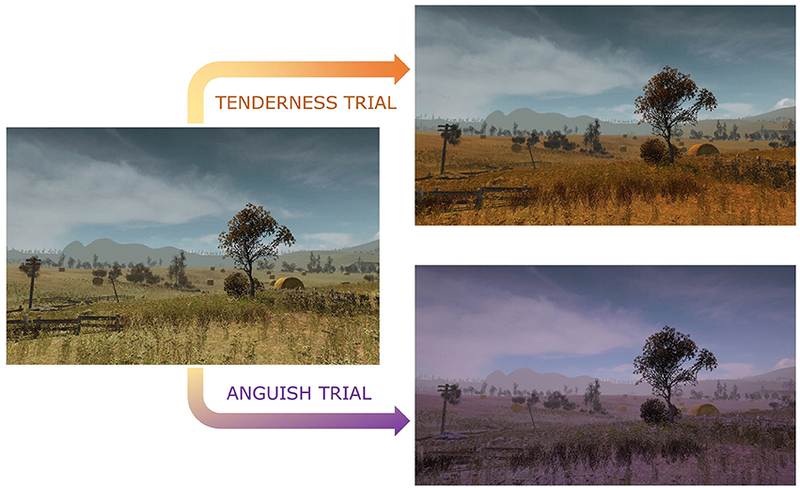 The virtual environment was prepared to alternate between different trial types: neutral (30″), tenderness (46″) and anguish (46″). The trial types were displayed via changes in the base color hues of the virtual environment and via specific music excerpts. Music excerpts were fixed for each trial type, and not influenced by current neural/psychological states (no music for Neutral, mild, gentle music for Tenderness and eerie, distorted music for Anguish). Music excerpts were selected from 20 audio tracks, all normalized using the root mean square feature of Audacity software (Audacity, http://www.audacityteam.org). The audio tracks were previously rated to have comparable volume, pace, and rhythm. For the rtfMRI-NFB task runs, four excerpts for tenderness and four excerpts for anguish were played. Neutral trials were characterized by a normal colored virtual landscape displayed in the BCI with no background music. Tenderness trials were characterized by a change in the color of the virtual landscape to orange and were accompanied by tenderness music excerpts. Anguish trials commenced when the color of the environment turned to purple hues and were accompanied by anguish music excerpts. For training purposes, we recorded a video showing a sample of the virtual environment. The video lasted as long as one run of the rtfMRI-NFB task (10′ 8″) and was used by participants to practice tenderness, anguish and neutral states before the MRI. With this practice, participants could learn which music tracks and VR color changes in the BCI corresponded to tenderness, anguish and neutral trials. As shown in Figure 1, instead of a classic thermometer, the color of the virtual environment was used as BCI changed in real time with increased engagement of the neural activity/pattern corresponding to distinct target emotional states—orange for tenderness trials, purple for anguish trials and natural light tones for neutral trials. Participants were instructed to experience tenderness or anguish as intensely as possible in the respective trials and to increase the intensity of their emotion to turn in real time, the color of the virtual environment BCI to as orange as possible during tenderness trials, and as purple as possible during anguish trials, which increased in turn the corresponding neural activity/pattern. Figure 1. Color hue modulation of the virtual environment during rtfMRI-NFB. The color hue changes from baseline neutral trials to a more intense orange and purple as participants increasingly engage target brain regions for tenderness and anguish trials. Mental practice (MP) is usually provided in combination with other therapies, and new developments for neurofeedback to support MP have been made recently. The objectives of this study were to evaluate the effectiveness of MP and to investigate the intervention characteristics including neurofeedback that may affect treatment outcome. The Cochrane Central Register of Controlled Trials, PubMed, Embase, KoreaMed, Scopus, Web of Science, PEDro, and CIRRIE were searched from inception to March 2017 for randomized controlled trials to assess the effect of MP for upper limb rehabilitation after stroke. Fugl-Meyer Assessment (FMA) was used as the outcome measure for meta-analysis. Twenty-five trials met the inclusion criteria, and 15 trials were eligible for meta-analysis. Among the trials selected for meta-analysis, MP was added to conventional therapy in eight trials or to modified constraint-induced movement therapy in one trial. The other trials provided neurofeedback to support MP: MP-guided neuromuscular electrical stimulation (NMES) in four trials and MP-guided robot-assisted therapy (RAT) in two trials. MP added to conventional therapy resulted in significantly higher FMA gain than conventional therapy alone. MP-guided NMES showed superior result than conventional NMES as well. However, the FMA gain of MP-guided RAT was not significantly higher than RAT alone. We suggest that MP is an effective complementary therapy either given with neurofeedback or not. Neurofeedback applied to MP showed different results depending on the therapy provided. This study has limitations because of heterogeneity and inadequate quality of trials. Further research is requested. Mild traumatic brain injury (mTBI) is a leading cause of sustained physical, cognitive, emotional, and behavioral deficits in OEF/OIF/OND Veterans and the general public. However, the underlying pathophysiology is not completely understood, and there are few effective treatments for post-concussive symptoms (PCS). In addition, there are substantial overlaps between PCS and post-traumatic stress disorder (PTSD) symptoms in mTBI. IASIS is among a class of passive neurofeedback treatments that combine low-intensity pulses for transcranial electrical stimulation (LIP-tES) with electroencephalography (EEG) monitoring. LIP-tES techniques have shown promising results in alleviating PCS individuals with TBI. However, the neural mechanisms underlying the effects of LIP-tES treatment in TBI are unknown, owing to the dearth of neuroimaging investigations of this therapeutic intervention. Conventional neuroimaging techniques such as MRI and CT have limited sensitivity in detecting physiological abnormalities caused by mTBI, or in assessing the efficacy of mTBI treatments. In acute and chronic phases, CT and MRI are typically negative even in mTBI patients with persistent PCS. In contrast, evidence is mounting in support of resting-state magnetoencephalography (rs-MEG) slow-wave source imaging (delta-band, 1-4 Hz) as a marker for neuronal abnormalities in mTBI. The primary goal of the present application is to use rs-MEG to identify the neural underpinnings of behavioral changes associated with IASIS treatment in Veterans with mTBI. Using a double-blind placebo controlled design, the investigators will study changes in abnormal MEG slow-waves before and after IASIS treatment (relative to a ‘sham’ treatment group) in Veterans with mTBI. In addition, the investigators will examine treatment-related changes in PCS, PTSD symptoms, neuropsychological test performances, and their association with changes in MEG slow-waves. The investigators for the first time will address a fundamental question about the mechanism of slow-waves in brain injury, namely whether slow-wave generation in wakefulness is merely a negative consequence of neuronal injury or if it is a signature of ongoing neuronal rearrangement and healing that occurs at the site of the injury. Specific Aim 1 will detect the loci of injury in Veterans with mTBI and assess the mechanisms underlying functional neuroimaging changes related to IASIS treatment using rs-MEG slow-wave source imaging. The investigators hypothesize that MEG slow-wave source imaging will show significantly higher sensitivity than conventional MRI in identifying the loci of injury on a single-subject basis. The investigators also hypothesize that in wakefulness, slow-wave generation is a signature of ongoing neural rearrangement / healing, rather than a negative consequence of neuronal injury. Furthermore, the investigators hypothesize IASIS will ultimately reduce abnormal MEG slow-wave generation in mTBI by the end of the treatment course, owing to the accomplishment of neural rearrangement / healing. Specific Aim 2 will examine treatment-related changes in PCS and PTSD symptoms in Veterans with mTBI. The investigators hypothesize that compared with the sham group, mTBI Veterans in the IASIS treatment group will show significantly greater decreases in PCS and PTSD symptoms between baseline and post-treatment assessments. Specific Aim 3 will study the relationship among IASIS treatment-related changes in rs-MEG slow-wave imaging, PCS, and neuropsychological measures in Veterans with mTBI. The investigators hypothesize that Reduced MEG slow-wave generation will correlate with reduced total PCS score, individual PCS scores (e.g., sleep disturbance, post-traumatic headache, photophobia, and memory problem symptoms), and improved neuropsychological exam scores between post-IASIS and baseline exams. The success of the proposed research will for the first time confirm that facilitation of slow-wave generation in wakefulness leads to significant therapeutic benefits in mTBI, including an ultimate reduction of abnormal slow-waves accompanied by an improvement in PCS and cognitive functioning. Real-time functional magnetic resonance imaging (rt-fMRI) neurofeedback aids the modulation of neural functions by training self-regulation of brain activity through operant conditioning. This technique has been applied to treat several neurodevelopmental and neuropsychiatric disorders, but its effectiveness for stroke rehabilitation has not been examined yet. Here, we systematically review the effectiveness of rt-fMRI neurofeedback training in modulating motor and cognitive processes that are often impaired after stroke. Based on predefined search criteria, we selected and examined 33 rt-fMRI neurofeedback studies, including 651 healthy individuals and 15 stroke patients in total. The results of our systematic review suggest that rt-fMRI neurofeedback training can lead to a learned modulation of brain signals, with associated changes at both the neural and the behavioural level. However, more research is needed to establish how its use can be optimized in the context of stroke rehabilitation. The number of stroke survivors is continuously increasing with the ageing of the population: about 15 million people worldwide suffer from stroke every year, of whom 5 million die, whereas another 5 million become chronically disabled (WHO, 2012). Behavioural deficits in cognitive and motor domains are highly prevalent and persistent in stroke survivors (Bickerton et al., 2014; Demeyere, Riddoch, Slavkova, Bickerton, & Humphreys, 2015; Demeyere et al., 2016; Jaillard, Naegele, Trabucco-Miguel, LeBas, & Hommel, 2009; Planton et al., 2012; Verstraeten, Mark, & Sitskoorn, 2016). Neurophysiological and neuroimaging studies suggested that stroke causes network-wide changes across structurally intact regions, directly or indirectly connected to the site of infarction (Carrera & Tononi, 2014; Carter et al., 2010; Gillebert & Mantini, 2013; Grefkes et al., 2008; Ward & Cohen, 2004). Disruptions in even one of the many networks or brain regions implicated in the different aspects of motor function and cognition can have a major impact on quality of life (Achten, Visser-Meily, Post, & Schepers, 2012; Hochstenbach, Mulder, Limbeek, Donders, & Schoonderwaldt, 1998). Accordingly, both local tissue damage and secondary changes in brain function should be considered when developing rehabilitation strategies to improve the recovery rate and generally increase the quality of life in stroke survivors (Chechlacz, Mantini, Gillebert, & Humphreys, 2015; Chechlacz et al., 2013; Corbetta et al., 2015; Gillebert & Mantini, 2013). In this regard, the use of neurofeedback may be a promising approach. Neurofeedback works as a closed loop system that provides real-time information regarding the participant’s own brain activity and/or connectivity, which can be used to develop self-learning strategies to modulate these brain signals (Weiskopf, Mathiak, et al., 2004). It follows the principle of operant conditioning, a method of learning that occurs through reinforcing specific behaviour with rewards and punishments (Skinner, 1938). If the participant learns to control activity of the brain areas targeted through neurofeedback, this may ultimately lead to a measurable behavioural change that is related to the function of those areas (DeCharms et al., 2005; Haller, Birbaumer, & Veit, 2010; Hartwell et al., 2016). The origins of neurofeedback are rooted in electroencephalography (EEG), which measures dynamic changes of electrical potentials over the participant’s scalp (Nowlis & Kamiya, 1970). This technique is portable and inexpensive, and provides estimates of brain activity at high temporal resolution. EEG neurofeedback has been widely used over the years to induce long-lasting behavioural changes, both in healthy volunteers and in patients (Gruzelier, 2014; Nelson, 2007). However, because of the low spatial resolution associated with this technique, it is very challenging to selectively target brain areas of interest. As such, the effects of EEG neurofeedback are often not specific (Rogala et al., 2016; Scharnowski & Weiskopf, 2015). Other neuroimaging techniques used for neurofeedback include magnetoencephalography (MEG) (Buch et al., 2012; Okazaki et al., 2015) and functional near-infrared spectroscopy (fNIRS) (Kober et al., 2014; Mihara et al., 2013). However, as also for EEG, their spatial resolution is relatively limited and they do not permit to target precise brain regions. Fig. 1. Real-time fMRI neurofeedback is a closed-loop system that can be used to voluntarily modulate brain-activity through the principle of operant conditioning. (A) The participants use self-generated or prior instructed strategies to attempt to change their brain activity. (B) fMRI data are acquired and (C) processed in real-time. Computer programs select the relevant signals and (D) return these to the participants after varied degrees of pre-processing to allow them to adjust their control strategies. Motor imagery based brain-computer interfaces (BCI) extract the movement intentions of subjects in real-time and can be used to control a cursor or medical devices. In the last years, the control of functional electrical stimulation (FES) devices drew researchers’ attention for the post-stroke rehabilitation field. In here, a patient can use the movement imagery to artificially induce movements of the paretic arms through FES in real-time. Five patients who had a stroke that affected the motor system participated in the current study, and were trained across 10 to 24 sessions lasting about 40 min each with the recoveriX® system. The patients had to imagine 80 left and 80 right hand movements. The electroencephalogram (EEG) data was analyzed with Common Spatial Patterns (CSP) and linear discriminant analysis (LDA) and a feedback was provided in form of a cursor on a computer screen. If the correct imagination was classified, the FES device was also activated to induce the right or left hand movement. In at least one session, all patients were able to achieve a maximum accuracy above 96%. Moreover, all patients exhibited improvements in motor function. On one hand, the high accuracies achieved within the study show that the patients are highly motivated to participate into a study to improve their lost motor functions. On the other hand, this study reflects the efficacy of combining motor imagination, visual feedback and real hand movement that activates tactile and proprioceptive systems. Motor imagery (MI) with neurofeedback has been suggested as promising for motor recovery after stroke. Evidence suggests that regular training facilitates compensatory plasticity, but frequent training is difficult to integrate into everyday life. Using a wireless electroencephalogram (EEG) system, we implemented a frequent and efficient neurofeedback training at the patients’ home. Aiming to overcome maladaptive changes in cortical lateralization patterns we presented a visual feedback, representing the degree of contralateral sensorimotor cortical activity and the degree of sensorimotor cortex lateralization. Three stroke patients practiced every other day, over a period of 4 weeks. Training-related changes were evaluated on behavioral, functional, and structural levels. All 3 patients indicated that they enjoyed the training and were highly motivated throughout the entire training regime. EEG activity induced by MI of the affected hand became more lateralized over the course of training in all three patients. The patient with a significant functional change also showed increased white matter integrity as revealed by diffusion tensor imaging, and a substantial clinical improvement of upper limb motor functions. Our study provides evidence that regular, home-based practice of MI neurofeedback has the potential to facilitate cortical reorganization and may also increase associated improvements of upper limb motor function in chronic stroke patients. There are some studies which showed neurofeedback therapy (NFT) can be effective in clients with traumatic brain injury (TBI) history. However, randomized controlled clinical trials are still needed for evaluation of this treatment as a standard option. This preliminary study was aimed to evaluate the effect of NFT on continuous attention (CA) and short-term memory (STM) of clients with moderate TBI using a randomized controlled clinical trial (RCT). In this preliminary RCT, seventeen eligible patients with moderate TBI were randomly allocated in two intervention and control groups. All the patients were evaluated for CA and STM using the visual continuous attention test and Wechsler memory scale-4th edition (WMS-IV) test, respectively, both at the time of inclusion to the project and four weeks later. The intervention group participated in 20 sessions of NFT through the first four weeks. Conversely, the control group participated in the same NF sessions from the fifth week to eighth week of the project. Eight subjects in the intervention group and five subjects in the control group completed the study. The mean and standard deviation of participants’ age were (26.75±15.16) years and (27.60±8.17) years in experiment and control groups, respectively. All of the subjects were male. No significant improvement was observed in any variables of the visual continuous attention test and WMS-IV test between two groups (p≥0.05). Based on our literature review, it seems that our study is the only study performed on the effect of NFT on TBI patients with control group. NFT has no effect on CA and STM in patients with moderate TBI. More RCTs with large sample sizes, more sessions of treatment, longer time of follow-up and different protocols are recommended. The use of Brain–Computer Interface (BCI) technology in neurorehabilitation provides new strategies to overcome stroke-related motor limitations. Recent studies demonstrated the brain’s capacity for functional and structural plasticity through BCI. However, it is not fully clear how we can take full advantage of the neurobiological mechanisms underlying recovery and how to maximize restoration through BCI. In this study we investigate the role of multimodal virtual reality (VR) simulations and motor priming (MP) in an upper limb motor-imagery BCI task in order to maximize the engagement of sensory-motor networks in a broad range of patients who can benefit from virtual rehabilitation training. In order to investigate how different BCI paradigms impact brain activation, we designed 3 experimental conditions in a within-subject design, including an immersive Multimodal Virtual Reality with Motor Priming (VRMP) condition where users had to perform motor-execution before BCI training, an immersive Multimodal VR condition, and a control condition with standard 2D feedback. Further, these were also compared to overt motor-execution. Finally, a set of questionnaires were used to gather subjective data on Workload, Kinesthetic Imagery and Presence. Our findings show increased capacity to modulate and enhance brain activity patterns in all extracted EEG rhythms matching more closely those present during motor-execution and also a strong relationship between electrophysiological data and subjective experience. Our data suggest that both VR and particularly MP can enhance the activation of brain patterns present during overt motor-execution. Further, we show changes in the interhemispheric EEG balance, which might play an important role in the promotion of neural activation and neuroplastic changes in stroke patients in a motor-imagery neurofeedback paradigm. In addition, electrophysiological correlates of psychophysiological responses provide us with valuable information about the motor and affective state of the user that has the potential to be used to predict MI-BCI training outcome based on user’s profile. Finally, we propose a BCI paradigm in VR, which gives the possibility of motor priming for patients with low level of motor control.